Flash forward to the present, we held our Thanksgiving dinner at my grandmother’s home this year. My responsibilities included mashed potatoes and a couple desserts. I opted to make a delicious pumpkin cheesecake with gingersnap crust and a chocolate mousse with phyllo crust. Since my mother’s birthday falls right around Turkey Day, I turned the pumpkin cheesecake into her very own birthday cake. I plated the cake on a silver cake stand, placed the cake safely in the middle of the table and went to round everyone up for the birthday song. As I turned the corner to head back to where I left the cake, I saw a large golden retriever, my grandmother’s unruly puppy, perfectly balanced on a chair and the table, munching away at my gorgeous cheesecake. Cue flashbacks of my childhood, including my mother fixing her own birthday treat. Luckily this cake was a little more dog friendly and we had a whole second dessert to enjoy. Preheat oven to 350 degrees. 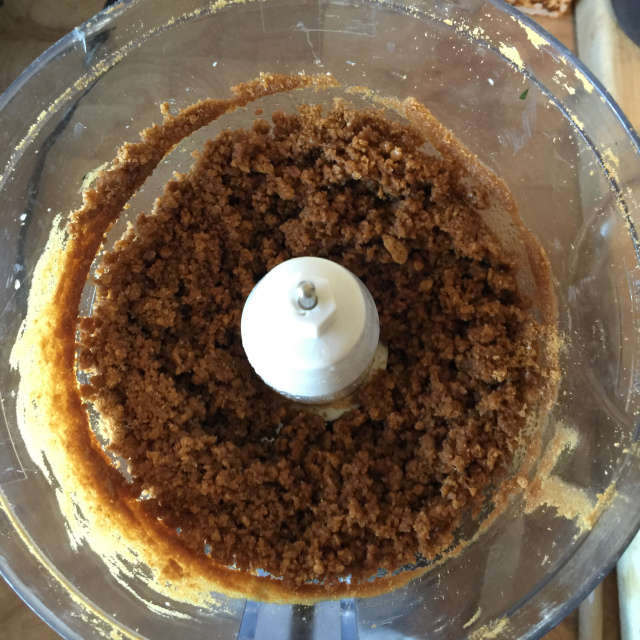 Pulse gingersnaps and sugar in a food processor until fine crumbs form. Add butter and pulse to combine. Press mixture evenly into bottom and up sides of a 9-inch pie dish. Freeze until firm, about 30 minutes. Bake crust until golden in spots, about 15 minutes. With the bottom of a measuring cup, gently flatten bottom and sides of crust. Let cool completely on a wire rack. Reduce oven temperature to 325 degrees. Pulse cream cheese in food processor until smooth. Add sugar and pumpkin and process until smooth, occasionally scraping down sides of bowl. Add egg and yolk, flour, salt, cinnamon, ginger, and cloves; process until incorporated. Pour filling into cooled shell and bake until custard is just set, about 33 minutes. Let cool completely on a wire rack, then refrigerate until cold and firm, at least 4 hours and up to overnight.